NORMAL MODE: The board transmits a data buffer (up to 950 ARINC Words). Upon termination, a Status Flag is set and an optional Interrupt Request is posted. LOOP MODE: The board transmits a given buffer (up to 950 ARINC Words). Upon termination, transmission is repeated until a STOP command is received. Data being transmitted can be changed without stopping the operation. A Status Flag is set and an optional Interrupt Request is posted every time the last word in the buffer is transmitted. LABEL MODE: The user specifies for each desired label its data value and a time interval. The board then periodically transmits each specified label at its specified period without interruption of operation. The labels and Periods can be changed without stopping the operation. In all receiving modes, a user written 256 bit Label Mask is applied to the received data, enabling to pre-filter non-relevant labels. Label-filtering is disabled by filling the mask with 1-s. 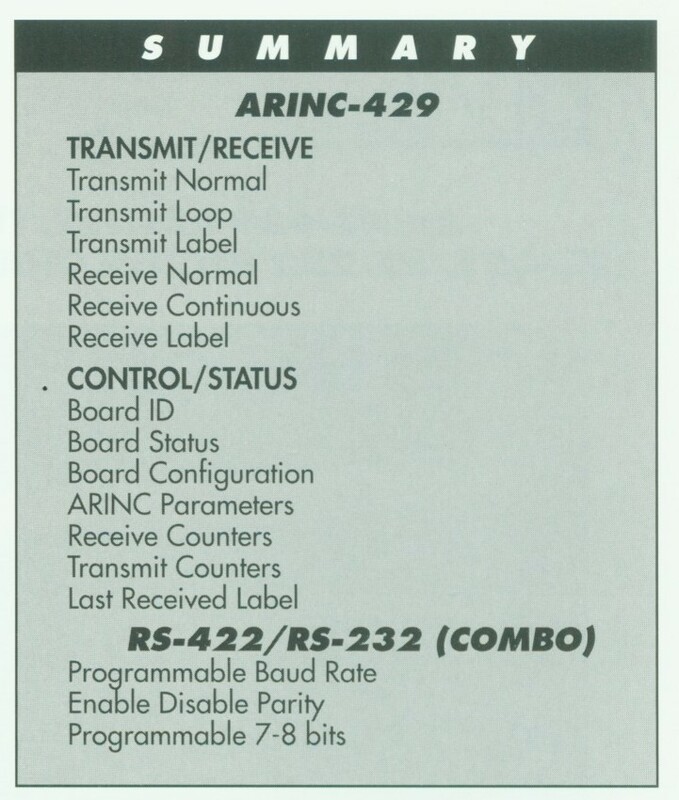 In addition to the operations described below, each time an ARINC data word is received in any of the receiving modes, a Status Flag is set and an optional Interrupt Request is posted. NORMAL MODE: The board store a data buffer (up to 950 ARINC Words). Upon termination, a Status Flag is set and an optional Interrupt Request is posted. 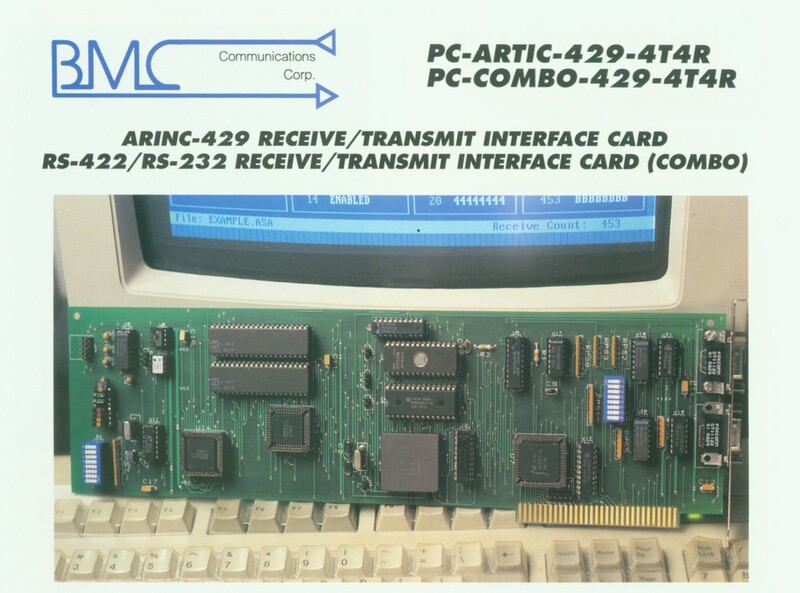 CONTINUOUS MODE: Received ARINC data words are stored in a user-specified buffer (up to 950 ARINC words). When the buffer is full, the buffer “wraps around “acting as a circular buffer Each time the receive count is a multiple of the buffer size a Status Flag is set and an optional Interrupt Request is posted. Receiving is terminated using the STOP command. A Status Flag and an optional Interrupt Request are posted when the Receive Buffer is half- full as well. The board can be set to send an interrupt request when it receives a particular label. LABEL MODE: Received ARINC data words are stored in a user-specified 256 words long buffer Each cell in the buffer corresponds to Label value. Each time a data value is received on the Bus, the board stores it in the corresponding cell. Receiving is terminated using the STOP command. The above receiving and transmitting modes are supplemented by a cluster of Control and Status functions via which the user can specify additional conditions and modes of operation and receive from the board Status and Data such as Receive Count, Channel Status, System ID, Last Received Label and more.